In a not so surprising announcement, Matt Forte said via Instagram that the Chicago Bears will not resign him. Forte battled injuries during the 2015 NFL season and also lost playing time down the stretch to Jeremy Langford. So yes, the writing was on the wall for most of the season and it said the Bears were ready to move on. 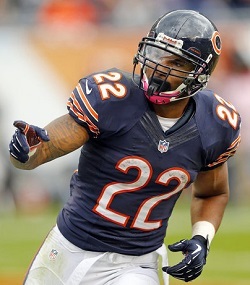 Forte has spent his entire career with the Bears since he was drafted in 2008. He was pretty much a star for them since the minute he stepped on the field, rushing for 1238 yards and catching 63 passes in his rookie year. He never looked back either. Matt is only 30 years but that is the age where running backs start to break down. While he did miss three games in 2015 it was only the second season of his career where he missed more than 1 game. All of which is pretty remarkable for a guy who usually gets 300-350 touches per season. While Forte’s stats in 2015 don’t look overly impressive I’d say they are. He missed three games AND lost playing time but still had 262 touches. What did he do with those touches? He ran for 898 yards averaging 4.1 yards per carry and caught 44 passes averaging 8.8 yards per reception (3rd highest of his career). The problem is the Bears have decided to go younger, Jeremy Langford was impressive in his own right when Forte missed time. Langford ran for over 500 yards himself but also caught 22 passes, so he’s proven he could fill the Forte role at a much cheaper price. I expect there to be a big market for Forte this offseason. Forte proved he could still play when healthy. With the remarkable durability he’s shown throughout his career I’d think many teams call his agent. He’s already been linked to the New England Patriots where I think he’d be a great fit. Other potential fits could be the Dallas Cowboys (no explanation needed), Indianapolis Colts (replace Frank Gore), Seattle Seahawks (good offensive fit/mentor Thomas Rawls) and the Houston Texans (again no explanation needed). It will be fun to watch this unfold only thing for certain is that Forte wants to go to a contender and play for a Super Bowl. Appearing on Friday’s edition of NFL Network’s Super Bowl Live, Forte suggested that he would be willing to take less money to join a Super Bowl contender in 2016.